UCI Transportation offers California Department of Motor Vehicles (DMV) automated services, becoming the first university and first independent location in California. 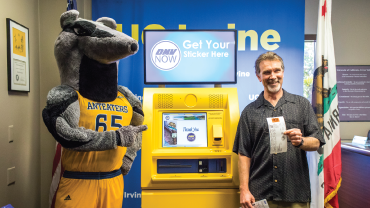 UCI faculty, staff, students and visitors may now process vehicle registrations or file for Planned Non-Operational status through an automated DMV NOW Self-Service Terminal. Conveniently located in the main UCI Transportation office at 200 Public Services Building, DMV NOW services will be available Monday through Friday, 7:30am - 4:00pm and no appointments are necessary. Patrons bringing their registration renewal notice or past registration card for processing may immediately receive their new registration card and license plate tag. 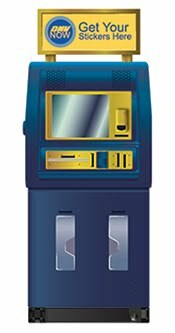 The touch screen machine offers instructions in English and Spanish and accepts credit cards and checks.